See that cute little photo? That's my eldest son, Will. He just got home after being away for 10 weeks. He spent his summer on a Summer Project with Campus Crusade for Christ. I'm so proud of the way he worked and learned and grew as a man of God this summer. I'm thankful to have him home. When he got home, though, he had a surprise for us. He told us about a special adventure he and a few of his friends had during the last week of the Project. That last week included a good bit of free time for the students to enjoy--sort of a vacation after their summer of hard work. Guess what Will did during his vacation? Yep. 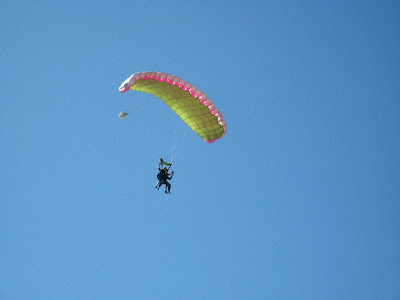 He jumped out of a plane. One of his friends took that shot of him as he was about to land on the beach. But I'm especially thankful for this photo, which one of his friends took after he landed. Is he crazy? No. Well, maybe a little bit. Mostly he's a 19-year-old boy. His summer activities showed that he stands on the Solid Rock. Which is even more important than standing on solid ground. That photo would make any mother's stomach do jumping jacks. He's a smart boy for not telling you about it beforehand. ;) Love your way with words!! I love this. And aren't you glad you didn't know until it was OVER!? Whew! Those are the kinds of surprises you like to hear about after the fact! 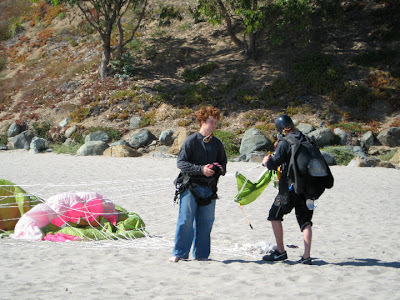 My son did his first sky diving a couple of years ago. He sent me a picture they had taken during the jump. It was scary! Boys will be boys. What a great way for your son to spend the summer! I know you must be so proud of him! Love your pantry! Especially the words you put on the wall! oh i love that bit about the rock... so true! but he jumped out of a plane? it was quite nice of him to keep it a secret til he was safe & sound! do you have some time with him before he heads back to school? Your son is a brave boy. Thank goodness you found our about his adventure after the fact! Oh sweet mercy. Aren't you glad you didn't know he was gonna do that? What a handsome young man you have!!! Glad to hear about his summer adventures and how he served the Lord on his mission trip. Love & blessings from NC!